Figure 15.5. Nucleotide sequence and secondary structure of the prokaryotic initiator tRNA (left) (S. K. Dube, K. A. Marcker, B. F. C. Clark & S. Cory, Nature 218, 232-233, 1968), compared with the prokaryotic methionine tRNA participating in elongation (right) (S. Cory, K. A. Marcker, S. K. Dube & B. F. C. Clark, Nature 220, 1039-1040, 1968). Note the unpaired 5'-terminal nucleotide residue, a unique CC duplet in the D loop, three consecutive G:C base pairs in the anticodon helix, and the invariant U33 of the anticodon loop turned outside in the initiator tRNA. Correspondingly, formylmethionine is always the first residue of any polypeptide chain to be synthesized by the prokaryotic ribosome. During subsequent elongation the formyl residue is cleaved off by formylase (Adams, 1968). The first methionyl residue is often, although not always, cleaved, also cotranslationally, from the growing polypeptide chain by a special aminopeptidase (Capecchi, 1966). Three proteins are generally required for initiation of translation in prokaryotic systems; they are referred to as initiation factors - IF1, IF2 and IF3 (for reviews, see Maitra et al., 1982; Gualerzi et al., 1986, 1990; Hartz et al., 1990; McCarthy & Gualerzi, 1990). All of them have an affinity for the 30S ribosomal subunit. It is probable that under the in vivo conditions they are mostly trapped by free 30S subunits thus forming the so-called "native 30S particles" which are competent to enter the initiation process. IF1 is a small basic protein with a molecular mass of 8 kDa (71 amino acid residues in E. coli). This factor seems to be an auxiliary protein taking part in dissociation/association of ribosomes at the early and late initiation steps, respectively, and in stabilization of the interactions of the 30S subunit with the other factors and F-Met-tRNA. IF1 has not been found in some bacterial species. IF2 is a large acidic protein possessing the GTP-binding domain homologous to those of EF-G and EF-Tu. It has been isolated from E. coli in two forms (products of the same gene) differing in molecular mass: IF2a of 97 kDa (889 amino acids) and the truncated form IF2p of 80 kDa (732 amino acids) Both forms appear to function equally in initiation. This protein is the principal initiation factor responsible for the GTP-dependent binding of F-Met-tRNA to the 30S ribosomal particle and the ribosome-induced GTPase activity. 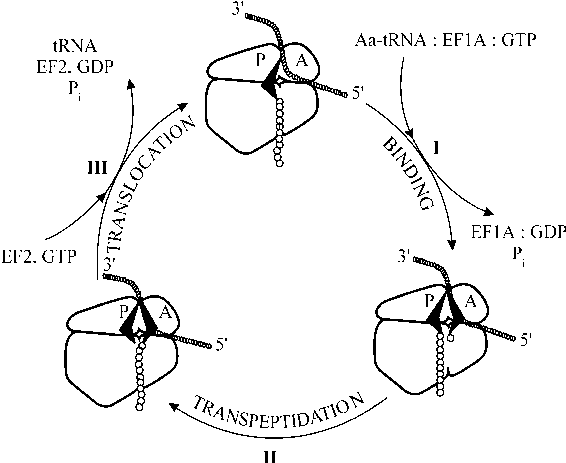 The recognition of F-Met-tRNA by IF2 seems to involve the T-loop and T-stem of the tRNA. IF3 is a slightly basic protein with a molecular mass of about 20 kDa (181 amino acids in E. coli). When bound with the 30S subunit it prevents the reassociation with the 50S subunit. Being a component of the initiating "native" 30S particle, IF3 seems to contribute to IF2 binding, mRNA binding and, more important, to selective binding of initiator tRNA, probably recognizing its anticodon stem. There is an evidence that IF3 destabilizes the complexes of elongator tRNAs with the 30S subunit (i.e., the wrong complexes). Structurally this is an interesting protein: it has a dumb-bell shape and consists of two independent compact a/p domains connected by a long a-helix (Biou et al., 1995). The exposed p-sheets of the two domains are separated by 45 A and thought to interact with two distant regions of the 16S RNA on the 30S ribosomal subunit.« It is interesting that one of the binding site of IF3 on the 16S rRNA (positions 790-793 in the middle domain; see Fig. 6.1) seems to be involved also in the subunit association. This supports the assumption that IF3 shields the 16S rRNA site important for the subunit association, and so that it has to dissociate from the 30S initiation complex to allow formation of the 70S ribosome.